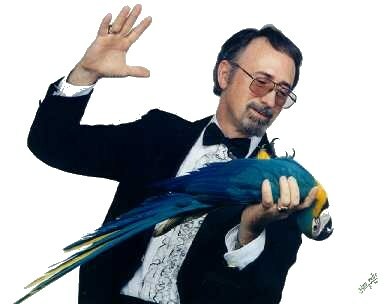 Duane has been entertaining on stage and at corporate events for over 25 years. As a magical entertainer, he's performed throughout the Midwest. Duane has a BA in Creative Writing from the University of Missouri. In addition to having been a guest on television and news shows, Duane was the star and central theme of the "I Believe in Magic" fashion show in Kansas City, Missouri, which showcased Calvin Klein and other famous designers. Duane also acted as a technical advisor to a participant in the Kansas City portion of the Miss America Beauty Pageant. Duane was also featured in Discover Kansas City, Shifra Stein Productions , a guide to unique shops, services, and businesses in Kansas City, and also in A Kid's Guide to Kansas City, Harrow Books. Performing has always been a part of Duane's life. While growing up, Duane watched and listened as his father played and sang country music. When Duane was nine-years-old, his father gave him his first guitar. By the time he reached high school, he was playing in a rock and roll band. He continued to play in rock bands during his tour of duty in the Air Force, playing with former members of such bands as The Safaries. When he left the military, he played the guitar in his father's country western band. Then the magic bug bit him. But even as he worked to perfect his brand of magic, Duane never forgot his musical roots. Occasionally, he drags his electric synthesizer along to a performance at a banquet, where he plays dinner music for the audience until showtime. Duane's audiences have wondered at Duane's ability to flow easily from music to magic, whether he's causing their spirits to soar, or someone's physical body to float. In the world of magic, Duane stands out not only as a magician, but as a musician and teacher. A professional musician before he became a professional magician, Duane still brings his electric synthesizer along to certain venues. As a teacher, Duane has taught classes to children in every aspect of magic from close-up magic to stage. His students graduate with a fundamental knowledge of everything from sleight of hand with coins and spongeballs, to the technical magic behind the wonder and mystery of a stage performance. But above all else, Duane strives to honor his Lord, Jesus Christ, by bringing a higher standard of personal and professional behavior to those for whom he performs. Duane's shows are always family oriented, and kid-friendly. You need never be concerned about the content of Duane's shows.